May 28, 2010 — The Federal Aviation Administration (FAA) announced the performance requirements for aircraft tracking equipment that will be required under the Next Generation Air Transportation System, or NextGen. The avionics will allow aircraft to be controlled and monitored with greater precision and accuracy by a satellite-based system called Automatic Dependent Surveillance - Broadcast (ADS-B). "We have reached a major NextGen milestone," said U.S. Transportation Secretary Ray LaHood. "This technology represents another step forward in our ability to make America's skies the safest in the world." The final rule, developed with extensive input from the aviation community, requires aircraft flying in certain airspace to broadcast their position via ADS-B by 2020. The rule mandates that the broadcast signal meet specific requirements in terms of accuracy, integrity, power and latency. "This rule gives the green light for manufacturers to begin building the onboard equipment that will allow our air traffic controllers to know where aircraft are with greater precision and reliability," said FAA Administrator Randy Babbitt. "That is one of the key elements of NextGen that will improve the safety and efficiency of flight." Additional ADS-B services should allow pilots to view cockpit displays to see the location of other aircraft in the sky around them. ADS-B displays are envisioned that will show pilots where they are in relation to bad weather and terrain - even at night or in conditions with poor visibility - and provide flight information, including temporary flight restrictions, which allow pilots to plan safe, more efficient routes. Some of this information is now being broadcast free to aircraft equipped with ADS-B in the Gulf of Mexico, South Florida and in the airspace above Louisville, Philadelphia and Juneau, Alaska. Those areas were chosen as key sites to roll out ADS-B due to challenges presented by vast stretches of water, rugged terrain and traffic congestion. These areas also are populated by aircraft already equipped with ADS-B. 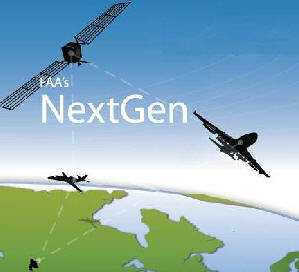 The nationwide rollout of ADS-B ground stations will be complete in 2013. By 2020, the FAA will require ADS-B equipment for aircraft flying in airspace including Classes A, B and C, around busy airports and above 10,000 feet.